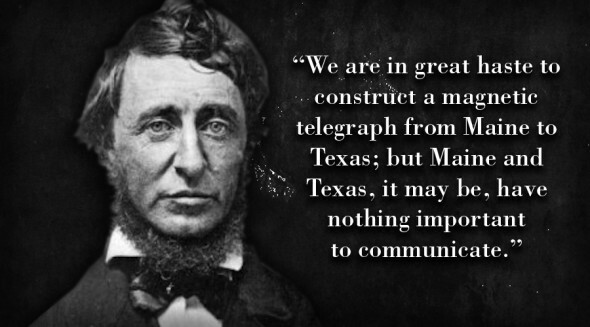 Now I have nothing against Maine or Texas as they just happened to be used in this metaphor. I think it brings up an important concept, however. The magnetic telegraph we call social media is constantly pushing boundaries and in today’s day and age we need to be able to critically evaluate it’s impact on our lives. Just because we have all of these tools at our disposal does not mean that we need to utilize them. If it isn’t helping your business or bettering your friendships then maybe you need to take a step back. In our increasingly expanding, and time consuming, online world it becomes more than easy to get caught up in trends. We need to realize that we, ourselves, all played a key role in creating the online world we see today and also play a key role in regulating it for the time to come. I like to look at today as being an ancient civilization. If a future race somehow discovered our digital footprint what would they find? A whole bunch of useless noise? If we have nothing important to communicate then maybe we all just need to shut up. Maybe we all just need to reevaluate what’s really important.